The transition to Retirement is a life-changing process of adjustment to new challenges and opportunities. The following story, from my schooldays, echo’s retirement sentiments. We were three best friends cycling from Killarney to Coolea on the last day of our school holiday in the West Cork Gaeltacht. We were the Rock & Roll Kids, that lucky generation born between the ending of the War and the coming of the Beatles. That journey lives on in my memory as a metaphor for life’s hopes and partings, challenges and transitions. a summer we thought would never end. We were speeding downhill together towards the village of Ballyvourney, sometimes coasting, sometimes peddling recklessly. Mullachanish towered over us, where legend has it Diarmaid and Grainne took refuge from an angry Fionn MacCumhail. The wind cooled my sunburnt face. 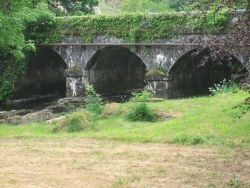 We swung right at the Mills Bridge, Droighead an Mhuileann crossing the gurgling Sullane River. The sign said Coolea 2 ½ miles. We were almost there. We felt privileged to be spending some part of our young lives in the countryside, to witness a way of life that even then was rapidly changing. I remember the excitement of first seeing rabbits and foxes and one evening a badger! We saw churns topped with warm frothy milk, blacksmiths hammering on the anvil and the thatcher weaving wonders with hazel, willow and straw Ni he la na gaoithe la na scolb (the windy day is not the day for fastening the thatch). ’A man cleaning the clay from the thread of a spade, in the subtle quiet of the sultry days, melodious the sound’. The golden sun in the red sky was shining directly into my eyes. 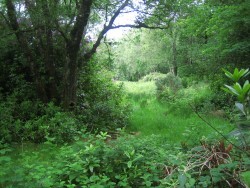 The lightly wooded rugged countryside was populated with beautiful native trees. Br. Vincent had identified them for us-Cuileann, Coll, Fuinseog, Saileach agus Beith gheal. (Holly, Hazel, Ash, Sally and Silver birch). 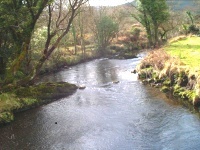 The narrow winding road followed the course of the lazy meandering Sullane River Eist le fuaim na habhann agus geobhar breacan Irish Seanfochail advising patience, listen to the sound of the river and you’ll catch a trout. Useful advice for young men in a hurry! We were cycling more slowly now, lost in our own thoughts. Da bhinn an beal a labhair riamh, is binne ina thost annseo (The sweetest voice that ever spoke is sweeter silent here). My senses became aware of the stillness of the evening, the scents and sights of the countryside wild woodbine, nettles, ferns, buttercups and cow parsley; the sound my own breathing, quieter now, I felt my tired limbs, the beating of my heart. Most of all the rhythm of the three bicycles whirring in harmony, merged into one sound. Though nothing was being said and young as I was, I knew that this moment was special. I’m sure my friends must have felt it too. We were in this enchanted place, on the last night of our last summer together. I wanted this feeling to last because beneath our youthful swagger, we were not omniscient. We felt vulnerable to life’s vicissitudes. Would we be good enough? Glac bog an saol, agus glacfaidh on saol bog tu. (Take it easy and the world will take you easy). 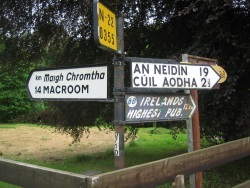 Welcome to Coolea, but through the spirit of our ancestors, like so many Irish phrases, it said more than that. The words Tog Bog e, take it easy, came to mind. I was back-pedalling now. I wanted these moments to last a little longer. I was looking forward to a cool glass of fresh creamy milk and crunchy soda bread from Maureen Mac an tSaoi; bean an ti. I hoped little Mairead and Billy would still be awake; I mightn’t see them again. Oh, you are welcome home! And then we were slowly, wearily pushing our bicycles up the steep hill towards the white-washed bungalow that had been our home for four weeks. The other bicycles parked outside the house informed us that some boys had already gathered from neighbouring houses for one last night of mighty craic! three happy school friends, together on their last night in Coolea. I wished that holiday didn't have to end! Would you agree that this story has some resonance with retirement sentiments, and the transition to retirement? This story can also be found at "Aistrithe" translated into Irish. I hope you enjoyed this story. Please share your Retirement Stories and Anecdotes! Subscribe to my monthly email newsletter, "Retirement Stories" for stories and tips on planning and enjoying an active retirement.